A depiction of Aleister Crowley's Thelema philosophy, Do as thou wilt shall be the whole of the law, adorns this eloquent satin drawstring pouch. It is the image of a woman bathed in light holding a gold chalice in her right hand and a silver chalice in her left as she pours her intentions and energy into the universe. 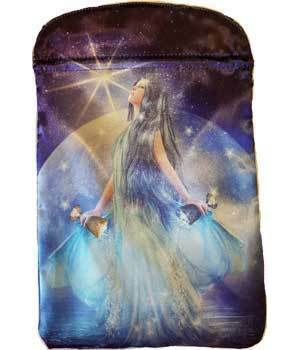 Measuring 6 inches by 9 inches this magical bag has a usable storage area of 5 and 7/8 inches by 6 inches and holds a boxed Tarot deck up to 4 inches by 5 inches by 1 and 1/4". This handy drawstring pouch is also the perfect size for protecting runes, crystals, pendulums, small statues, and other ritual items utilized in divination and magical practice.